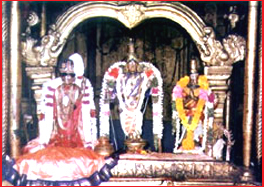 Avathara sthala of Periazhwar and Andal. Lord Ranganatha of Srirangam married Andal here. Andal and Garudazhwar are on either side of the Lord in standing posture. The standing posture of Garuda near the Lord is unique to this place. The Araiyar seva, like in Srirangam, is very famous. The place is named after the hunter kings Villi and Putthan who built this town and their images are installed in the temple. 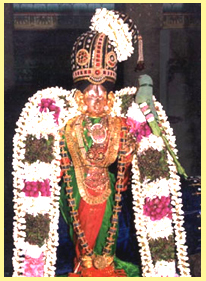 One day Periazhwar who was performing Pushpa kanikaryam for the Temple, found Andal wearing the garlands meant for Lord. That day Azhwar offered fresh garland to the Lord but the Lord refused to wear any other garland except the one used by Andal and hence Andal is called "Choodi Kuduttha Nacchiyar". Thaayaar - Aandaal (Kodhaa Naachiyaar). The Divine Thiruppavai is fully illustrated by way of sculptures circumambulating the central sanctum-sanctorum. Access to the temple Has its own railway Station(Virudhu Nagar -- Tenkasi line). Via Road:-- > Madurai - Tenkasi Road. The Moolvar of this Divyadesam is Sri Vadabhatra Saayi. Also named as Ranga Mannaar. Prathyaksham for Mandooga rishi and Periyalwar Moolavar in Bhujanga Sayanam, giving his seva facing along the east direction. This sthalam is in Tirunelveli district near Thirukkurungudi. We have to get down in Naanguneri when travelling from This temple is situated in Tirunelveli district, Tamil Nadu. When going in train, we have to get down in Sri Villiputtoor Railway station, Via Thenkaasi, Virudhunagar and getting down in the Srivilliputtoor station, we have to go 1 1/2 kms to reach the temple. Bus facility and lodging facility is also available.